Inspired by a “slow-wood” philosophy, an environmental historian built a timber-frame house that celebrates its roots in the land and the forest. During my last sabbatical, our family built a house from trees. I am writing a book about the history, ecology and conservation of the Eastern deciduous forest. But in the morning, faced with the choice of firing up my laptop or my chain saw, I tend to be drawn to the saw. Working in the woods ought to sharpen my writing about them. Anyway, building a house isn’t something you get the chance to do all that often. 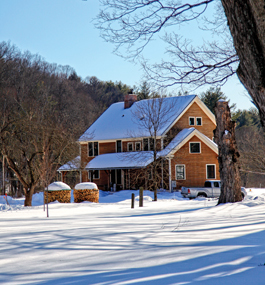 Some years ago, our family bought a farm in central Massachusetts, in a small valley not far from the Connecticut River. We co-own about 170 acres, including 60 acres of pasture and hay upon which we raise beef cattle. Setting aside beaver pond, meadow and swamp, that leaves about 100 acres in timber. Like most New England farms, our farm is mostly woods. And since we run from the riverbank to the ridge top, our woodland is wonderfully diverse, and includes most of the trees that grow in the region. Our partners bought the existing farmhouse. We bought a lot next door. (The rest of the farm was placed under an agricultural-preservation restriction to prevent development.) This left us with the challenge of building our house. Luckily, our farm partner Tom Chalmers is also an architect. We employed a slow-wood philosophy. Building a house is like cooking a meal, just a little … slower. By now, everyone has heard about the slow-food movement, which arose in opposition to fast food. Fast food is mass-produced and quickly gratifies our gross appetite for flesh, carbs, fat, sugar and salt. Slow food, by contrast, features diverse ingredients with dense nutrients, is carefully prepared, and is enjoyed at leisure with family and friends. Slow food also ties to our cultural heritage of regional and ethnic cuisines, and to distinctive traditions of transformation: Think hearth bread, aged cheeses, craft brews, vintage wines with terroir — signatures of time and place. Finally, the best slow food is local — it connects to sustainable care of the crops and livestock that fit the landscape surrounding the table. Eat your view, as the expression goes. But what about the kitchen table that bears the meal, and the house that bears the table? The same slow principles can apply to the wood that builds them. 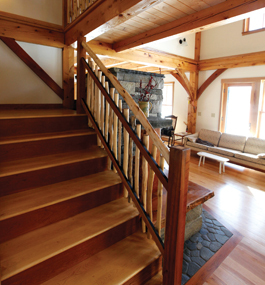 We built a traditional timber-frame house because it is sturdy and permanent, but mostly because it celebrates wood. In conventional stick-frame construction, the structure disappears. 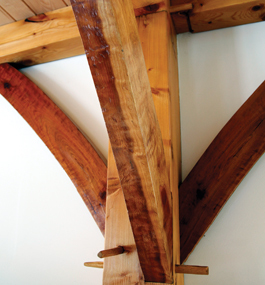 A timber frame is exposed, and becomes the main decorative element. You see inside what you saw outside. In our case, the floors, doors, cabinets and stairs also have their roots in our woodlot, and in a slow, careful approach to managing these woods. Finally, our house is heated primarily by burning wood in a massive, super-efficient masonry stove, completing the process of deceleration: slow food, slower wood, slowest stone. We selected woods for our house given what sustainable harvesting of the woods made available. We built using low-grade materials removed during the course of improvement cutting. 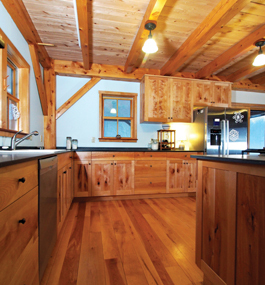 You can build a top-grade dwelling out of low-grade timber. I am not here to say that all houses should be built entirely from local materials, no more than I would advocate that everyone should eat nothing but local homegrown food. This way of building fit our skills, passions and circumstances. Our house is not that large — about 2,500 square feet — and in the end cost us about what a similarly sized stick-built house would have cost. 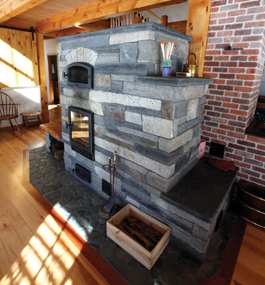 What we saved by using our own materials and doing some of the work ourselves we lost in the labor-intensive custom-built approach and the few luxuries we indulged in, such as the full-blown masonry stove. The stove’s financial payback, appropriately enough, will be measured in geological epochs. Its emotional payback has come a bit sooner. 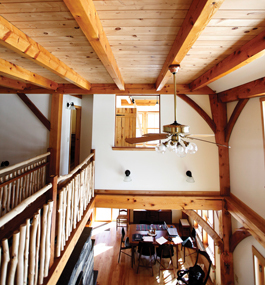 This timber-frame house is only one small example of the slow-wood philosophy. By itself, it could be seen as a romantic indulgence, excusable but without wider significance. Yet it stands for the larger possibility of reuniting our environmental instincts with a responsible use of local forests. 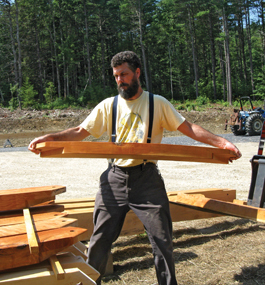 Right now, according to a recent New England Forestry Foundation report, heavily forested New England is producing less timber and other forest products than it consumes. If we wanted to, we could be sustainably harvesting far more than we consume, and sequestering more carbon in the buildings we inhabit. Now that new technologies allow wood to do the work of steel and concrete, our region needs to stand in its kitchen and cast a slow eye on its farmland and its forests. We need to take the time to reconnect the sources of our lives to the landscape we inhabit, and to involve our children not only in growing food, but in harvesting trees and building houses. 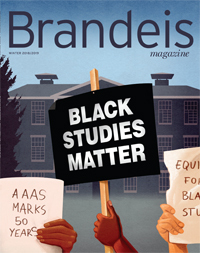 Brian Donahue, associate professor of American environmental studies at Brandeis, has been a farmer for the past 40 years. He is co-author of “A New England Food Vision,” a 2014 report published by Food Solutions New England, viewable at www.foodsolutionsne.org/new-england-food-vision. He also co-authored “Wildlands and Woodlands: A Vision for the New England Landscape,” at www.wildlandsandwoodlands.org.